MMS are a nationwide network of builders who specialise in property repair work. In the event of a fire, flood, storm or even a water leak, we have the specialised knowledge to restore your property. We are here to make sure that your property is brought back to its pre-loss state with as little inconvenience as possible. Our contractors cover Cleethorpes and all other areas of the United Kingdom. The MMS Building Contractor Network only use flood and fire restoration contractors who are fully qualified and experienced to manage this type of specialist work. If you have been unfortunate enough to have suffered from fire or flood damage to your home, the MMS Building Contractor Network are accessible around the clock through our nationwide helpline. We work with a group of independent loss adjusters that work for the public instead of your insurance provider. The main benefit is that an independent loss assessor will act on YOUR behalf rather than in your insurer’s interests. By doing this, they can negotiate directly with your insurance provider to ensure that you gain a fair payout. One of the main benefits of using the loss assessors that we recommend is that they specialise in evaluating this type of damage, so they are able to identify all primary and secondary damage in the first inspection. This ensures that complications do not arise later once your insurer has settled your claim. When you hire us for your flood or fire damage repair work we provide a free loss adjusting service to all our insured customers. Property damage due to flooding has become more regular in recent times. Because of this, we have considerably increased the amount of flood damage restoration specialists we have in the UK to meet demand in the autumn and winter. Our flood restoration specialists can help you, regardless of whether your home has been damaged by a water leak or a major flood. Before any reinstatement work can be started, our Cleethorpes flood restoration experts will make sure that any dampness within the structure of your property is thoroughly dried out first. Secondary damage must be identified as soon as the drying out process starts, as water can seep into hidden areas of your property such as wall cavities and floorboards. It is imperative that all secondary damage is identified and dealt with as soon as possible. If this is not done, there could be potential problems later on. These problems might affect the restoration work that has already been completed. When water and moisture remain within the structure of your home, harmful bacteria and dampness can breed. This can become a health risk to you and other occupants of the property and must be treated before it becomes a problem. We use the latest drying equipment and infra-red water detection equipment to ensure that your home is fully dried prior to starting the process of restoring your home or business. When your property is damaged by fire, MMS understand the impact it has on your everyday life. As well as the destruction that has occurred, there may be personal items that you may never be able to get back. We can help out by not only repairing your fire damaged property back to its pre-loss state, we can also offer help and assistance in making sure you gain your full entitlement with your insurance claim. If a fire damages your home, it can be very destructive. Our professional Cleethorpes fire restoration experts can deal with all resulting situations caused by the fire. For instance, when a fire is extinguished, water damage can be another problem that needs to be addressed. Also there may be damage that may not be obvious, including melted wiring, which will need to be addressed. Regardless of the amount of damage, our network has the skills and expertise to complete all fire restoration work. We can recommend and even pay the fees of an independent loss adjusting group to deal with your fire insurance claim (see loss assessors section). When you submit a property claim to your insurance company they may ask you to obtain a couple of builders quotes. 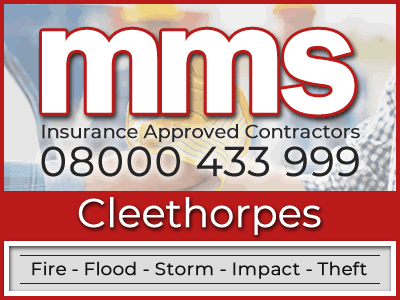 MMS are an insurance approved building company that possess extensive experience of repairing properties which have become affected by fire, flood, escape of water, impact or theft. If you require a quote from insurance approved builders please phone us on 08000 433 999. Alternatively, please feel free to get in touch by filling in your details via our request a quote form.